The next thirty days may be the toughest for college football fans. You know college football is just around the corner but it’s… not… quite… here… yet. How will you ever survive? You’ve probably already got it on your calendar, but just in case you don’t: college football returns August 26, 2016, at 10:00 PM ET as Hawaii takes on California in Sydney, Australia. This post contains affiliate links. Help us bring you more entertaining and informative posts by supporting us and using these links. We thank you for your support! Maybe we can find some more tips to survive until football season next year. They will probably feel left out when you drop them at the end of August. Take the time to go out to dinner with them. You might need these friends when you don’t want to talk about how your team just choked in the big game. Don’t forget to tell these friends that they are important to you. Get your tailgate game fine-tuned by going to a big time concert. Jimmy Buffett, Kenny Chesney, and Guns N Roses all have summer tours going on and provide you an opportunity to tailgate. Test out new recipes and clear off the dust from your tailgating gear. Train your liver for the massive amounts of alcohol you are about to enjoy over the next few months. The RV Tailgate Life is hitting up the Toronto Cider Festival on our way to the GT-BC game in Ireland. Find one in your local area and hit the festival with friends. Remember, you won’t have time for home projects once football season begins. So do them now. Check with the spouse to make sure you have everything done so you won’t be pestered while the big game is on. Once football season is here, you won’t have time to take a vacation. So take your spouse, your kids, and friends to the beach. Or go see family. Whatever you need to do to check off that family contact requirement to keep everyone happy. Don’t forget to tell them that you’ll be out of contact until near the end of the year. Or all of them. Remember the highlights and groan over the bloopers. Get excited about how this is the year by watching the best games from last year or if you had a bad season, then you may want to go back a few seasons to get some good games. Friday Night Lights, Blue Mountain State, and The League are all streaming on Netflix. Amazon Prime has All or Nothing, a Season with the Arizona Cardinals and Ballers. You can also check out football movies like The Longest Yard, Rudy, Jerry Maquire, Pony Express, Varsity Blues, and You Don’t Know Bo on Netflix. Amazon Prime doesn’t appear to have the best selection of sports movies, but if you already have a subscription it is worth checking out: Tim Tebow: On a Mission, Mississippi Juco: The Toughest Football League In America, Game of Honor: Army vs Navy. Take the season schedule and make time to read up on each of your opponents this season. Find out who their star players are expected to be. Who did they lose from last season? What new freshmen are they excited about? Who has a tough schedule? Who do they play before you? How did they rank in the Fulmer Cup this offseason? Make sure you have plenty of trash talk prepped for the week leading up to each opponent. And of course all season for your rivals. Just about every team will be releasing hype videos to get you excited for the upcoming season. Even if you aren’t a Georgia Tech fan, watch this year’s video below. Team Chaplain Derrick Moore will have you running through a brick wall! Other great speeches include his October 4, 2014 speech to the Yellow Jackets before the Miami-GT game and October 25, 2015 speech “We Ain’t Dead Yet” before the Miracle on Techwood. The preseason rags are about to be released – find out why they think your team is going all the way or will dwell in the cellar. Whatever they write, there is something for everyone to love and everyone to hate. So get the discussion started. Most college football fans adopt a second or third sport to survive the offseason. Most likely, it’s basketball and/or baseball. This year, you aren’t stuck watching only baseball as we wind our way to the college football season – you have a whole smorgasbord of sports at your fingertips with the Rio Olympics. Whether its swimming, gymnastics, soccer, or baseball, there’s something out there to keep you entertained for a few hours each day until football starts. If nothing else, you can have fun laughing at Rio’s expense for all the unfinished facilities. You can say what you want about the 1996 Atlanta Olympics, but we had habitable dorms and complete event facilities without bankrupting the city. The Olympics also give you a chance to try “homegating” or throwing a tailgate like party at your house. Get decked out in USA gear and fire up the grill. NBC just released it’s schedule for the 2016 Rio Olympics. NBC will either air or live stream every event, beginning on August 3. That should be enough to OD on for now. 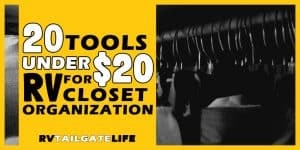 Pull all your tailgating gear out of the RV and out of the garage (or wherever else you store it). Make sure you have enough chairs and other tailgating gear. Replace anything worn out. See what you need to add new. Think mosquitoes will be an issue this fall? Prepare your tailgating gear with these mosquito repellent tricks. Get rid of that tube TV and replace it with a new flat screen TV. Build a table. Add organization to your basement compartments. Add solar panels or extra fresh water tanks. Replace that carpet with laminate flooring. Replace the shower head. 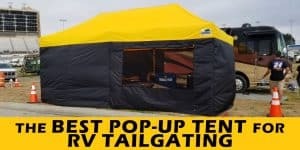 There’s always something that you want to do to make tailgating more enjoyable in your RV. Now is a great time to do it. Have you checked all the engine fluids? Changed the oil recently? Checked out the generator? How is the roof holding up? Make sure all your RV maintenance is up-to-date so you don’t have to put your rig in maintenance during the season, possibly missing some games. Last thing you want to be is stuck on the side of the road on a roadtrip with no idea who to call when your RV breaks down. Make sure you have an up-to-date roadside assistance plan. If you don’t, look into Good Sam Roadside Assistance with no limit towing to the nearest service center. Do you have themes for your tailgates? Take time now to plan them out, find interesting and new recipes and coordinate with your tailgating buddies who will bring what. It’ll save headaches later if you have a game plan going into the season. Sure, it is subject to change, but have some ideas. Have they moved your tailgating spot? What about the route in – any detours due to local construction or road closures? Are the tree limbs high enough to get the RV in without damaging your roof or do you need to find an alternate route? Do you need to have discussions with your school about cutting limbs back near your spot? Act now so that you have time to find alternatives if need be. Artists are releasing new hits that you should add to your tailgate playlist. If you need some help, check out the playlist we created on Spotify for you. It has all genres of music for tailgating – Classic Rock, Pop, Country, and Rap. We’ve got you covered! Male, female, it doesn’t matter. Part of college football is looking the part. This is the one time you might be able to get away with a grown man wearing a team jersey. Ladies love finding the perfect dress to match the most amazing shoes and jewelry. It’s all part of the package and every year deserves to be special. Make sure your wardrobe matches your team spirit! Also, make sure your game bags comply with the Clear Bag Policy. The NFL first adopted it in 2013 and now colleges across the country have or are implementing the same policy. Make sure you can take your bags in with you (or leave them behind). Got tickets? Are you RVing it? Plane tickets and hotel? Who is going with you? Where will the tailgate happen? Do you need to take vacation days? Get the details in order for any road trips you plan to take this season. For some road trips, we know that it doesn’t make sense to take the RV (too far from home, quick turnaround time, work schedules). Are you ready to upgrade your cellphone? If so, do it now so you’ll have the best camera and Wifi service for game day! Check to make sure you have all the necessary apps, like Facebook and Twitter for trash talking with friends and rivals, Printicular for printing photos, and ESPN for getting updates on news and scores. Since you’ll be using the phone like crazy, invest in a Mophie battery pack (iPhone 6/6s | Samsung Galaxy S7) to give you that extra battery boost. The mophie also acts as a hard shell protector for your phone in case you drop it. If you don’t want the extra battery life, then check into a Lifeproof for waterproof protection or Otterbox for provide shock protection. OK, so we don’t know exactly when it will happen, but it will be soon. When the tickets get here, be sure to post to Facebook to let everyone know where you’ll be sitting and that you have your tickets. Your season ticket package may even come with some freebies, coupons for team gear, and a list of new policies. Make sure you know what you can and cannot bring into the stadium this year. College teams are moving towards the NFL model with the clear bags. Every year the NCAA tinkers with rules. 2016 is no different. New rules are in effect for targeting, tripping, and blocking below the waist. While you are reviewing the new rules, also take time to brush up on the hand signals from refs. Sometimes you can’t hear them with the mic problems or the boos, but they usually show them on the Jumbotron. Bonus points – read up on the actual refs. Know the best heckles. It’s a time for the school to show off the football stadium or practice facilities, ask for more money, and let you mingle with the players while getting some autographs. Take the kids, even the ones too young to enjoy a real game, and let them get pictures with their favorite players. 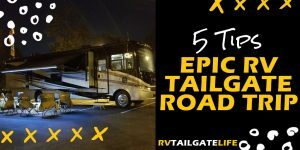 Some die hard RV Tailgaters even use it as an excuse to tailgate…. If you are in Atlanta or nearby, take a break from the scorcher outside and chill in the air conditioned glory of the College Football Hall of Fame. Find your team’s helmet in the atrium’s display (hint: if you can’t find it, they will help you out by lighting it up). See stories about some of history’s greatest players and events. See displays about tailgating, uniforms, and the coaching family tree. Great way to spend an afternoon preparing for football season. Hey it’s not college football. It doesn’t even count for the season. But it’s real live football. Between two teams. That you don’t already know the final score of. Bonus: name all the players you see that you got to see play college ball last year. Not just your team, but your opponents too. You’ll be surprised who you get to see if the preseason games, particularly in the second half. Should they really release polls this early in the season when we don’t know anything about anybody? You don’t know how the teams are going to react to new head coach (or not firing an old coach) or even position coach. How’s the team going to deal with losing seniors to the draft? Who really knows anything about how freshmen are going to do in college? Too many issues to being able to realistically determine who is the top team in college football. It’s just a popularity contest right now. You made your menu and now it’s time to implement the plan. Get all the food for week one and start any prep that needs to be done before you pack up the RV. Don’t forget the beer and whiskey! Saturday game? Start tailgating Friday. Maybe even Thursday. Wonder how early we can actually start? For Georgia Tech and Boston College fans, we are starting early. Many of us are taking vacation to go to Ireland. I’m sure many of the Hawaii and California fans are doing the same with Australia. At least for us, we don’t have to wait a full thirty days of torture because the fun gets to start early. Lucky us! What are your tips to survive until football season gets here? Let us know in the comments below!